There might still be a chill in the air, but spring is in sight and with it comes new adventures, new clothes to wear and new things to experience. Whether you're packing your case and heading on holiday or discovering new foods, wandering the streets, showing your children something new, looking at art or architecture. Just remember to participate in all that life has to offer and say YES to new adventures! I have recently said YES to something exciting in my life. 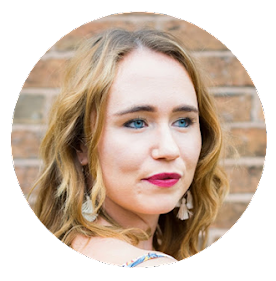 I am now an official ambassador for Boden a British fashion brand founded by Johnnie Boden in 1991 and designed all in-house in London. This will be the biggest fashion brand I have worked with in my blogging career and I couldn't be more grateful. 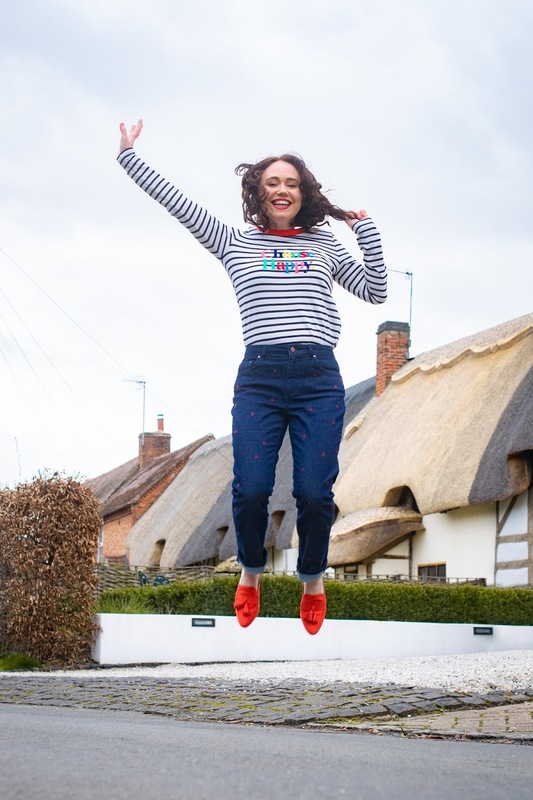 I will be sharing lots of my colourful and fun Boden outfits over on my Instagram and blog over the next few months and hope you can join me on this exciting journey! For March, Boden's key message is dressing for living. They are encouraging us to be a bit braver and bolder, to live a colourful life, discover new looks, experiment and to be the most expressive version of yourself. Those lucky enough to be heading on holiday are also in luck, because Boden have some gorgeous summer pieces online that include intricate embroidery, sculpting swimsuits, mix and match bikinis, unique details and quality finishes. 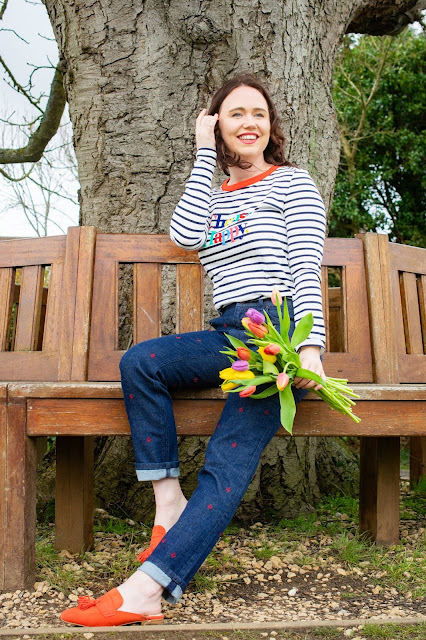 Boden have something for everyone whether you need some new work wear, party wear, every day or even lounge wear and nightwear pieces. 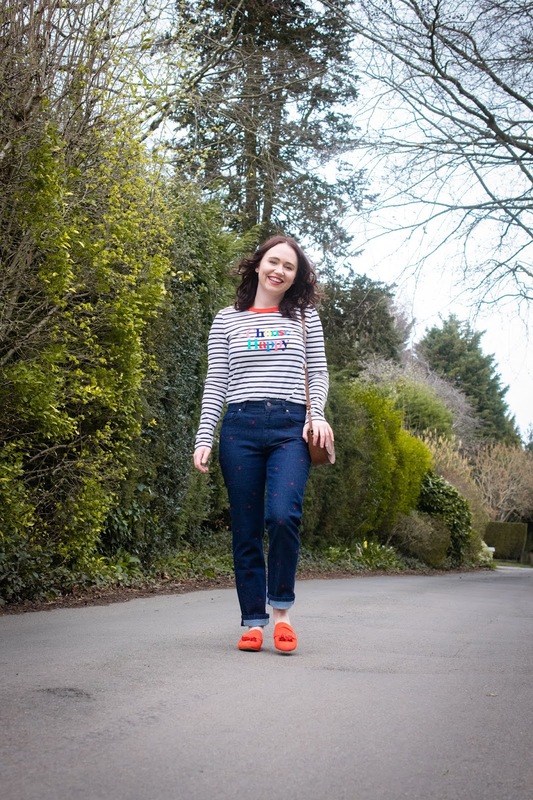 For March, I chose to style the following items from the Boden website (ALL WITH 20% OFF) and I have styled them two ways for spring. 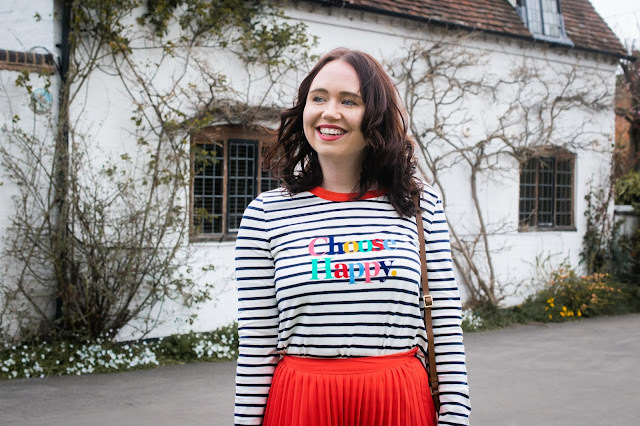 Because I love stripes so much I chose this as my key piece to style two ways. Firstly I love the fact it says "choose happy". This is definitely a great motto to have in life, because why shouldn't we all embrace happiness! For my casual look, I paired the striped tee with some girlfriend style jeans that are honestly the most comfortable jeans I now own. 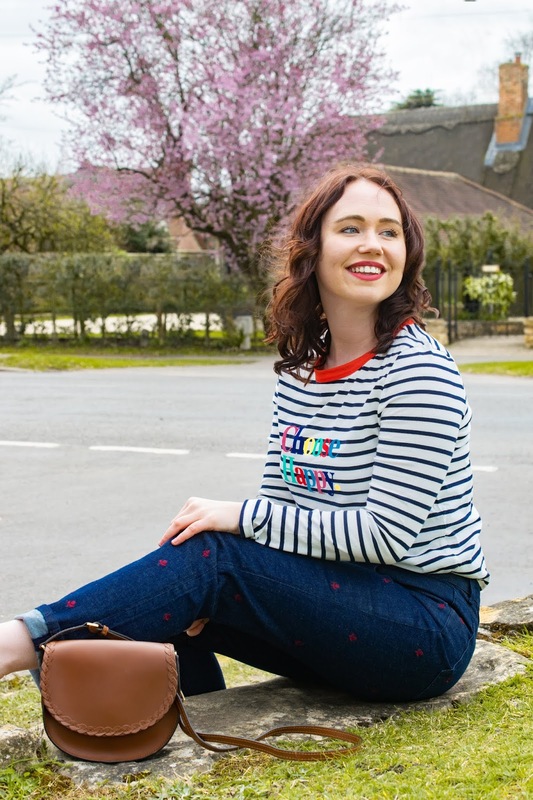 I'm now regretting not trying Boden jeans sooner and the best part is they come in petite, regular or long. This particular pair of jeans has a tiny red floral print all over which is perfect for spring. To finish off my Boden outfit I slipped on a pair of backless loafers in a rusty red colour and a tan saddle bag which are now officially the most expensive pair of shoes and bag I own. 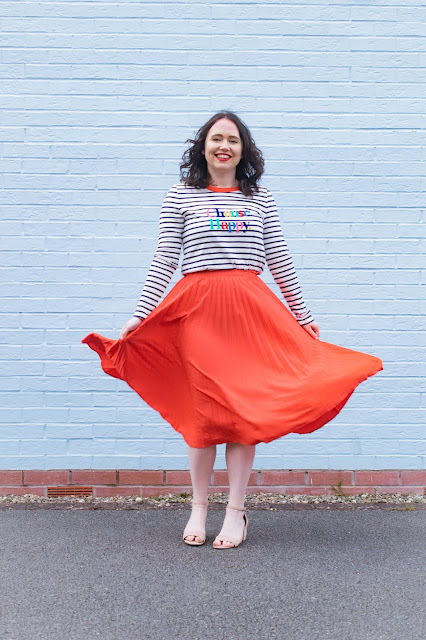 For my second striped Boden outfit, I wanted to add a bit more colour and fun to my look with this red pleated midi skirt. 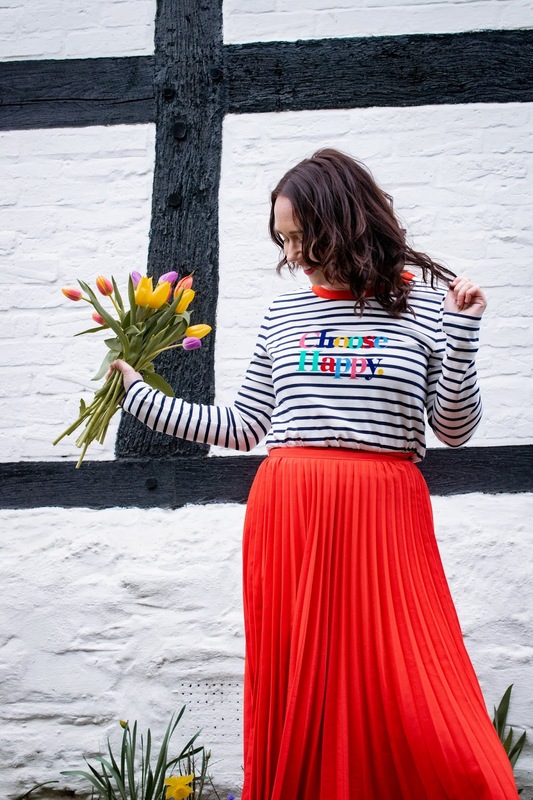 The perfect skirt length when there's a chill in the air and you could also pair this striped top with other coloured skirts including yellow, pink and navy blue! 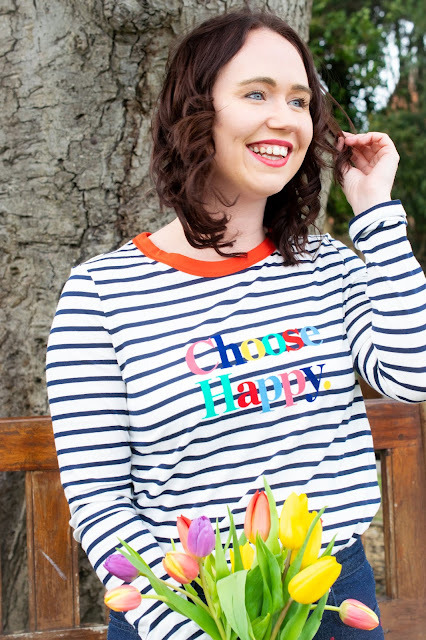 How would you style this striped Boden top? 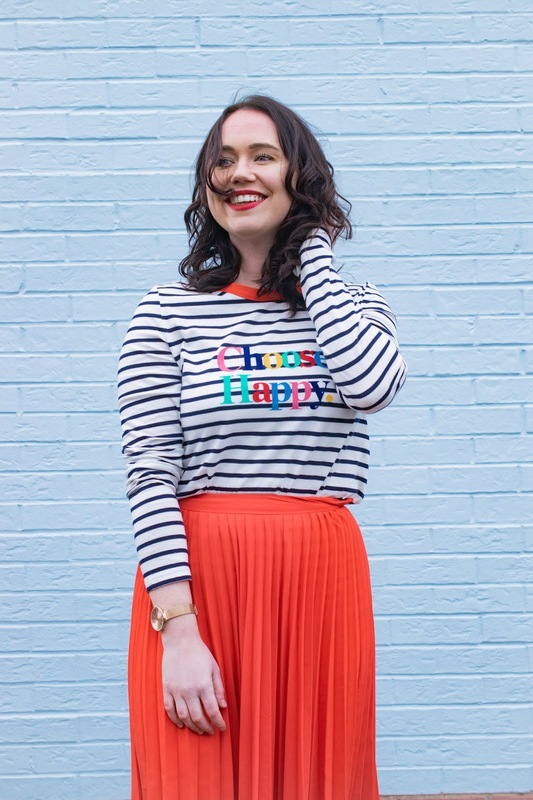 *I am an official Boden ambassador therefore all clothing featured in this post was gifted. Beautiful outfit dear, love the skirt! These are both such adorable outfits but I have to say the red skirt is my fave. Love your style. i like the way you styled stripes. the red skirt is very pretty too! The top with the pleated skirt is my fav!! Those stripes are adorable!